This LED mini integrated pointing illumination module (MIPIM) is a multifunction laser device incorporating visble and infrared aim lasers as well as infrared and LED white light illuminator. 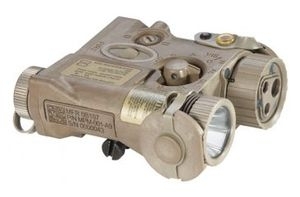 The Mini Integrated Pointer Illuminator Module (MIPIM) is a weapon mounted multifunction laser device with integrated visible and infrared aiming lasers as well as a variable-focus infrared illuminator. It is also equipped with a high intensity, variable-focus, white light illuminator. It allows for precise weapon aiming, target acquisition, and target / area illumination in low-light conditions or complete darkness. · Length: 4.1" x 3.2" x 1.7"